I like to cook. And sometimes store my recipes. Over the years I have tried KRecipes, kept my recipes in BasKet notes, in KJots notes, in more or less random word processor documents. I liked the free form entering recipes in various notes applications and word processor documents, but I lacked some kind of indexing them. What I wanted was free-ish text for writing recipes, and some thing that could help me find them by tags I give them. By Title. By how I organize them. And maybe by Ingredient if I don’t know how to get rid of the soon-to-be-bad in my refridgerator. The central bit is basically a markdown viewer, and the file format is some semi structured markdown in one file per recipe. Structured in the file system however you like it. There is a recipes index which simply is a file system view with pretty titles on top. There is a way to insert tags into recipes. I can find them by title. And I can find recipes by ingredients. Given it is plain text, it can easily be synced using Git or NextCloud or whatever solution you want for that. There is a markdown file describing the specifics of the file format. It is not declared 100% stable yet, but I need good reasons to break stuff. 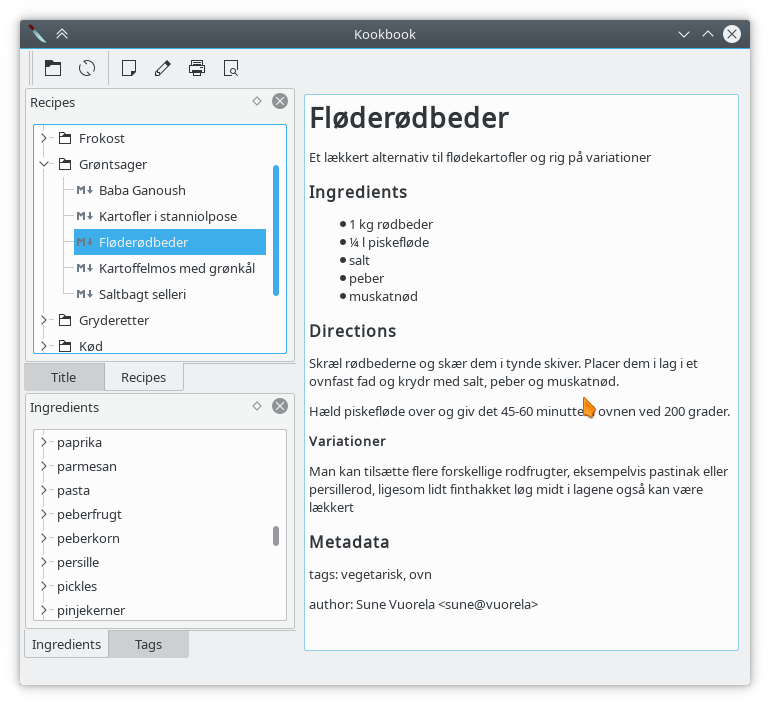 My recipe collection is in my native language Danish, so I’m not sure sharing it for demo purposes makes too much sense. Kudos for posting on cooking and ‘kookbook’ does look nice. Like you, I’ve tried lots of recipe management systems but my cooking process and my ‘fridge are too chaotic for a ‘system’. My solution is ‘plain text’ files in a ‘recipe’ folder, with file names that usually include the main ingredient and preparation method – ‘cucumber pickled.txt’, often with multiple recipes per file. Not pretty, but quite practical. Storing and modifying recipes is a breeze. Fire up KDE connect and today’s recipe is on my phone ready for the kitchen. A quick text search for “aubergine” gives me tens of options. Select, copy, cook. Sometimes the tools are already there. Yeah. This is basically a slightly improved version of that. This looks great. It sounds like it has about the right amount of organization without losing the mostly free-form markdown test. I am just getting into KDE, but I will have to build this and give it a try! It even sounds like a good basis for a very basic, general notes app (without the ingredients parsing, obviously). Looks nice. Thanks for sharing. I’d like to try it, but I’m not good at compiling. Do you have a “recipe” to build your app? I’ve tried build$ cmake -DCMAKE_INSTALL_PREFIX=/usr/share ..
you need Extra CMake Modules – a great collection of cmake addons created by KDE. Looks like a nifty project. I didn’t feel like writing XML by hand. Markdown is much easier to write. Oh. and check the license for recipeml.